This is seriously one of the best toasted french loaf slices I’ve ever been served. I chose to eat my curry with bread and didn’t regret. The curry was thick and delicious, not too spicy. But then again, my threshold for all things spicy is quite high so you shouldn’t take my word for it. 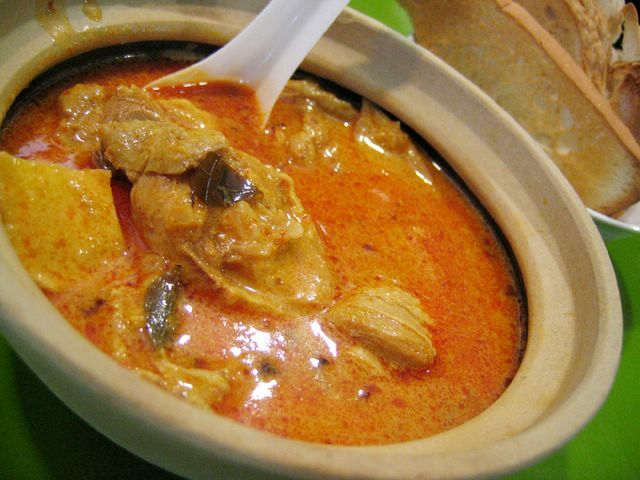 Curries is one of my favourite foods mainly because I grew up on curries. Dad makes the best curries. I love his Devil Curry especially. I am trying hard not to drool! haha. 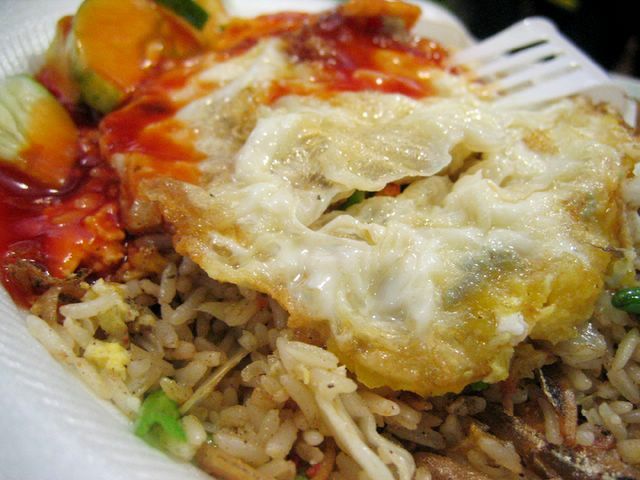 Here’s some Nasi Goreng that JF tried. It’s not too bad. I liked that they added ikan bilis (anchovies) to the dish. 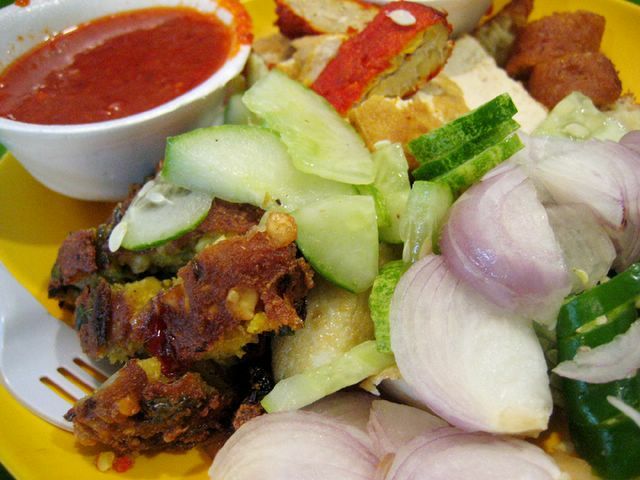 It seems like I have been eating alot of hawker food lately. Which isn’t a bad thing! It’s so much cheaper I tell you. I’m so so glad Singapore is such a food paradise. That’s why hardly anyone can starve even if they wanted to. nice bloggie!! oh, btw i got to see this by bel’s bloggie.. oh ya, nice recipes too.. The kambing soup there is very good as well (unless you take mutton). Flavourful, mutton cooked til soft, not oily. YUM! Yes, indeed the curry there was yummilicious! That was my dinner for one night. I used to go Adam’s Rd Food Center a lot when my campus was still at Bukit Timah. The Prawn Mee Soup (pretty decent serving of big prawns) and Nasi Lemak ( i like the chilli & the aroma of the rice) were defintely the most popular choices among my friends! Ahh..those were the days. Shelly: ah, was always too skeptical to actually try it! but now that I’ve heard your ‘verdict’, i’ll def. try it the next time i’m there… thanks! rosa: Oooo yummy.. another curry fan eh? hey, u like jap curry? though it’s not that spicy… it’s just so yummy! BoZo: ya! u ate it with rice or bread? 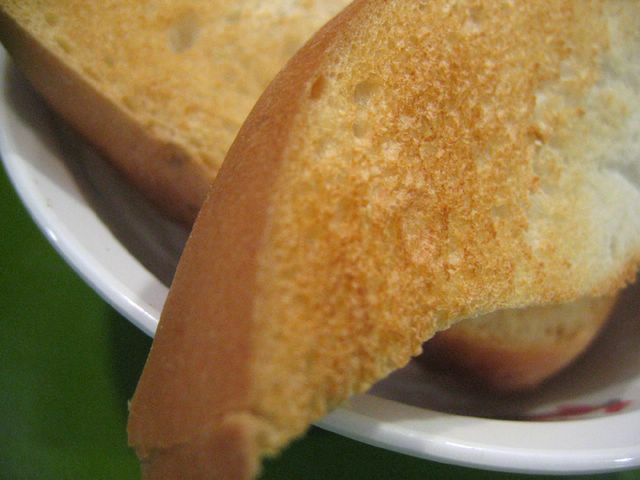 don’t you think the bread was well-toasted? i’m so amazed! i read your blog after ages!!!! I miss Singapore… DESPERATELY!!! I’m pregnant, I’ve got cravings, I’m vegetarian, and I live in rural Japan… sigh……. so make my day and please post a nice pic of brownies??? got any recipes for microwavable brownies?? still dont have an oven here. also, what’s your take on the 2-in-1 microwave plus convection ovens? Wonder if u stil remember me! I’m Yan Ling here..your P1-4 Classmate. Anyway..was googling for Miss clarity Cafe stuff n I happened to chance upon your food blog! What a surprise! It’s really cool to see those delicious recipes n wonderful descriptions! Do you happen to bring a digi cam around all the time! haha…I’m sure to read ur blog as much as possible to gain more insights!